Based on a 1980s children's TV series, this offering sees you playing the mighty Super Gran – an elderly lady with super powers! Sadly, this game doesn't quite portray her too well. 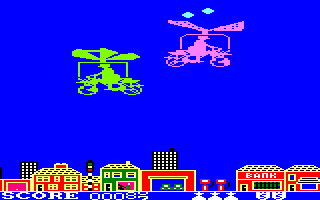 Some very large and crude graphics flicker along as you sit in your single-coloured flying bike taking out clones. If you play this any further, you no longer need this bike and see Super Gran in all her glory – a large, flickery sprite. The TV soundtrack plays during the game and even this is laughable. I feel sorry for anyone who owned this! Race across four continents, each divided into several stages, and make it to the final stage before your time runs out. You can choose which of the four races to compete in. Each one is located on a different continent, with Africa being the easiest course and Europe the hardest. Your motorbike has a turbo booster which you can only use when it has reached its normal maximum speed of 280km/h – you'd better hang on when you use it! Unfortunately it's not a good game. The graphics are ugly and colour is used poorly. The music which briefly accompanies each race is tinny, and the time limits are so tight that if you make the slightest mistake, you have very little chance of reaching the next checkpoint. 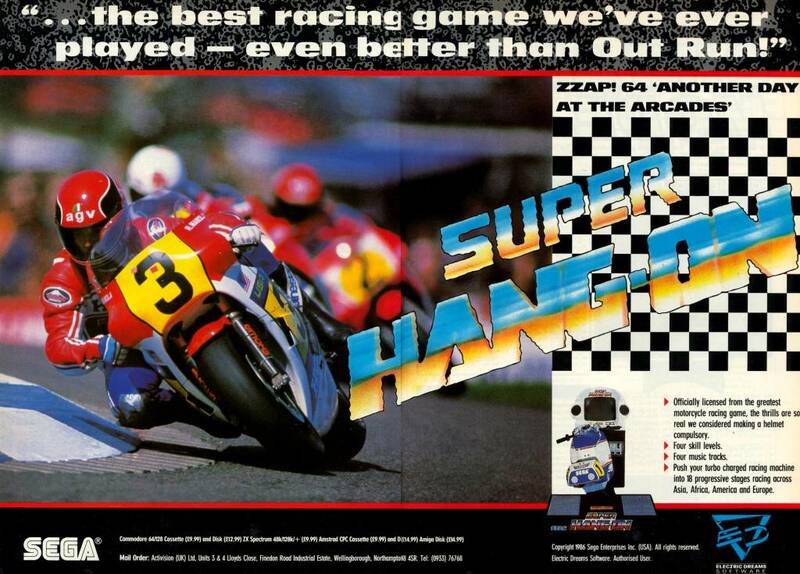 This is not one of the better motorbike racing games. It's not easy being a god, and to prove your worthiness, your fellow gods have set you a challenge. The aim is to defeat five Guardians roaming inside a large labyrinth – but you do this by destroying their spirits, and they aren't located in the same rooms as the Guardians. Before looking for the Guardians, it's necessary to find four items – a pair of shoes, a bag, a hammer and a helmet – which enable certain actions such as jumping and carrying objects. It's an isometric exploration game, and if you're a fan of the genre, you'll instantly recognise the inspiration for this game. 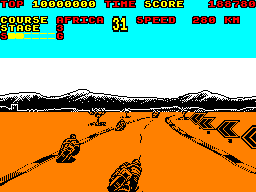 The graphics are very detailed, although the size of the screen is a bit small. However, although it's good, it seems to lack something in comparison with other games like it. New York has become a dangerous place in the year 2089. Crime is rife, and armed gangs of rival thugs roam the streets, killing each other and many innocent citizens. But who's this on the scene? It's Superkid! You have to fly around each level, restoring order by flying into the thugs. A lever at the bottom of the screen shows how much crime there is; if it goes too far to the right, you lose a life. Your aim on each level is to rescue children and to guide the pensioners safely to their rest home, preventing the thugs from killing them. The graphics and music are both good, but the game quickly becomes monotonous, particularly by the third level where it's a lot more difficult to help out the citizens. See also: Skatin' USA, Superkid in Space. Aliens are threatening the Earth, and it's up to Superkid to save everyone. Superkid must travel to five of the alien planets and find four nuclear detonators so that he can blow the planet into oblivion. There are a variety of aliens which behave differently and which will sap your energy if you touch them or the bullets they fire. 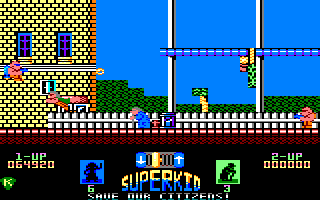 Fortunately Superkid has a gun and lots of grenades at his disposal, and lots of ladders which magically extend up to the nearest platform. The game retains the look and feel of its predecessor, with colourful graphics and cute (maybe too cute) music. It's also a better and more enjoyable game to play thanks to the smaller levels. See also: Skatin' USA, Superkid. Darkseid, a powerful supervillain, has invented the deadly Omega Beam and aims to use it on the population of Metropolis. As people walk around, Darkseid tries to lure them into his underground mines, while Superman tries to prevent this. This maze-like game is a tricky one where you affect barriers along the streets to guide the citizens to safety. Power gems are also required to allow Superman access to these other screens where even more people wander around. The graphics are nothing special but move smoothly, with only a few sound effects added too. See also: Superman: The Man of Steel. Darkseid is back, and this time, he's brought a friend – Lex Luthor. Together they are planning the destruction of all mankind! To make matters worse, Lois Lane is being held hostage by the same mad duo. 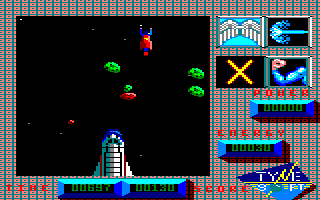 The first stage places you in a slow and sluggish 3D shoot-'em-up, followed by a vertical scroller where you defend a Space Shuttle (which is better). The next stage sees you inside the satellite that is controlled by Lex. Throughout the game, Superman can make use of his various powers, but they all have limits. Pleasing and colourful graphics make this one an eye-catcher – but where's the famous soundtrack? See also: Superman: The Game. Another coin-op conversion makes its way on to the CPC. You're racing around the Grand Prix circuits of the world, but first you must qualify, and then you must reach a certain position after three laps if you want to go on to the next race. In addition, the track may also be wet, making things trickier for you. The graphics are good, especially the digitised pictures, and the girl in the yellow swimsuit! However, the scrolling is too slow and it doesn't feel as if you're doing 200mph at all. 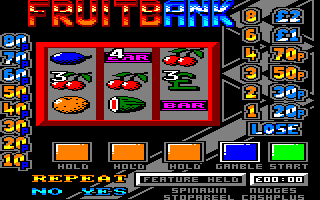 While you can't win or lose any money on computer-based fruit machine games, they should at least be able to capture most of the excitement of gambling your shiny coins away. This game does not do that. The three reels scroll at a snail's pace so that you have to wait ages before they come to a stop, and on top of that, there aren't many bonus features on the fruit machine to make things a bit more exciting. Having said that, it seems to be easier to win money in comparison with other fruit machine games, but it's not worth the effort or the wait. 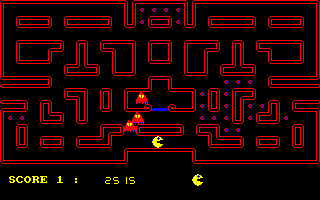 This is another Pac-Man clone for the CPC; eat all the dots while avoiding the ghosts... 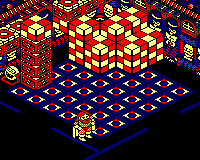 The maze is large and the level of difficulty can be adjusted to make the game easy or hard. Sadly, the maze layout never changes between levels, so boredom will soon kick in. 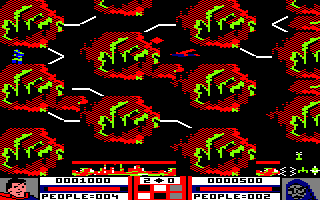 The MODE 1 visuals are adequate, with smooth sprites and a few chirpy sound effects.